This attribute returns current configured capacity of a worker for an appropriate channel. For example if a worker’s Chat capacity is configured to 3 and Voice capacity is configured to 1 then, worker.channel.chat.configured_capacity returns 3 and worker.channel.voice.configured_capacity returns 1. This attribute returns the appropriate channel’s current available capacity between 0 and 100 for a worker, where 0 means the worker is capped out handling Tasks for the channel and 100 means the worker is fully available to handle Tasks for the channel. 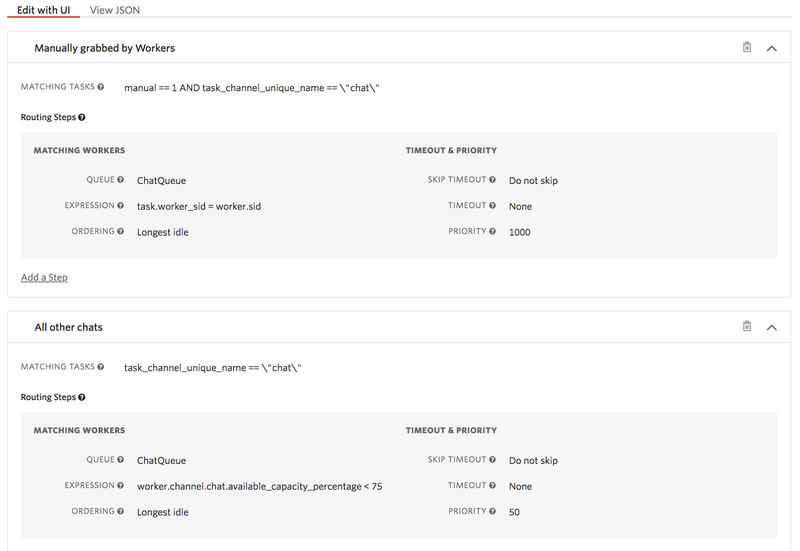 For example if a worker is configured to handle 1 voice Task and three Chat Tasks and is currently assigned to one Voice Task but not assigned to any other Tasks, worker.channel.voice.available_capacity_percentage returns 0 while worker.channel.chat.available_capacity_percentage returns 100.